It should have infinite durability too, just because if you wanted to take advantage of it, you have to place it and mine it. It should also be consuming with the diamond. 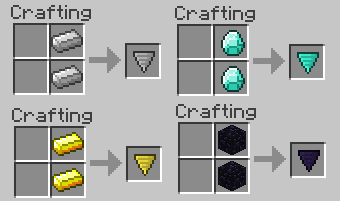 I feel this would make a cobble generator factory easier if this was added in the same update as the hopper. This would make a factory that I only have to wait for it to fill the chests up for me. So find three diamonds and never need to make another pickaxe again? Well done on making another suggestion I disapprove. How about you can make a cobble factory with the hopper and walk away and wait for it to fill up chest after chest? Also, you will have to place it, power it, then mine it again. That would be a very slow process. It will only work on the block in front of it. Okay, now you are looking for things to disapprove for an invalid reason. If you have to do all of that to mine one block at a time, what's the point in having it at all? SO YOU CAN WALK AWAY FROM YOUR COBBLE GENERATOR!!!!!!! Which apparently is its only real use, and even then you're asking for it to be combined with something we do not--nor may ever--have. No the redstone update, no one cares about it, they are just gonna leave it out. If you have the advanced cobble generator, and you take the charge going to the piston and delay it and make that go to the drill, you can have the drill break the cobble right after it gets pushed into position. Like the redstone update is just gonna get left out just like the adventure update, or something like that. BloodyPhoenix, one word, hush. Just because your a "nether resident" doesn't mean you can disapprove every topic you post on. Why don't you come up with a better idea if you think this one is so bad. You don't have to be so blunt, you could of said it nicely. I think this would be a great idea instead of mining yourself. Thank you for the support PigMiner. Couldn't have said it better myself. If you don't want more features added to your game, don't update, and better yet, don't post here. We don't want to hear the people that don't want more features added. If only we could overturn the people like bloodyphoenix. 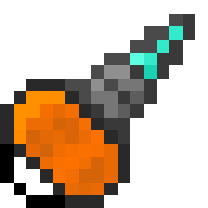 i meant thats how the crafting recipe for the tip of the drill should look like. Hmm, the drill is a physical block you place. Not a tool. It should require diamond but never break. problems it could be a tool that use only in creative mode that way it doesn't affect the game play of survival. I support this ideal I think minecraft could use more tools to aid builders especially in creative mode who just want to create stuff. Since we don't have the wand like the pc. I like the concept of walking away from a factory and come back to a chest full of cobble, on survival without leaderboards disabled. Well, excuse me for not liking a single idea you've come up with. Just because your a "nether resident" doesn't mean you can disapprove every topic you post on. I am entitled to approve or disapprove what I please. And for the record, I do not disapprove of every topic on which I post. Why don't you come up with a better idea if you think this one is so bad. I have no reason to. I've made numerous suggestions that have received high feedback. You don't have to be so blunt, you could of said it nicely. That was my nice way of disapproving. I'd be banned if I weren't "nice." I am done posting on this topic. This will end up in a flame war if I continue. I would like to build castles with the cobblestone that this thing makes. It could make life a lot easier. Yes, especially in survival mode.